There are several pros and cons when considering a tonneau cover for your pickup truck. Tonneau covers can be made of hard or soft materials and their purpose is to protect cargo in the bed of a pickup truck from environmental elements. The cover is also used to conceal items stored in the truck bed when the vehicle is unoccupied. Tonneau covers can be pricey, depending on the type and brand you opt to purchase, therefore it’s important to do your research before buying one. Protection from weather elements: One of the biggest benefits to installing tonneau covers on your pickup trucks is the instant protection it provides from elements such as rain and snow. Furthermore, the sun’s UV rays can damage your belongings (such as perishable materials, electronics and more), as well. Your cargo will be safe from any dirt and debris, moisture (which can potentially lead to mold), and animals. Protection from theft: Theft is a struggle that pickup truck owns face when leaving their cargo unattended in the truck bed. Whether you’re running errands in town during the daytime, or your vehicle is parked overnight in your driveway, if your items aren’t covered they’re susceptible to being taken. By installing a tonneau cover with a lock system, you don’t need to worry about theft any longer. 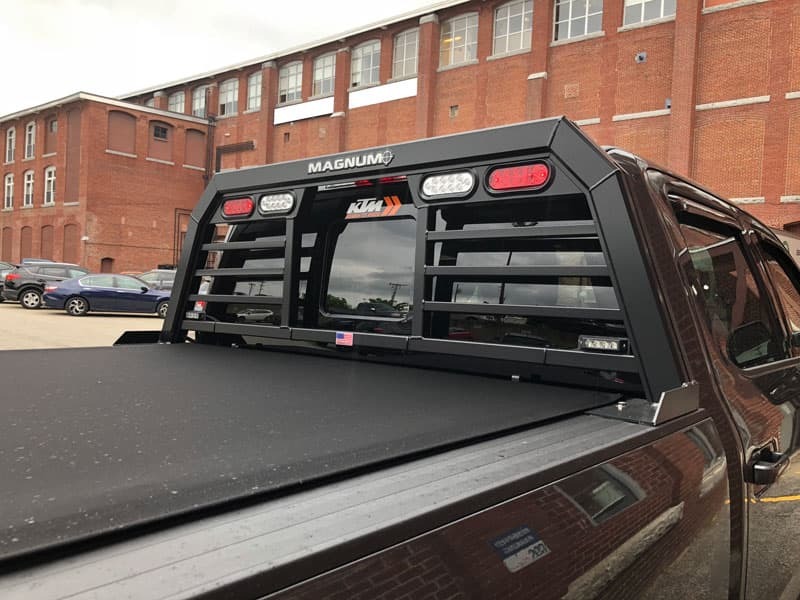 Added appearance to your truck: Aside from the more obvious benefits listed above, a tonneau cover also provides protection from your truck appearing dirty, or faded from the sun. Also, “a cover just makes your truck look neater and more streamlined rather than having a bunch of items rolling around in the bed of your truck,” according to Auto Anything. “Old school trucks look great with old school vinyl covers… You can even polish up the snaps! Got an 80’s truck? The roll up covers look right at home on these trucks, no snaps or Velcro to clutter up the look. Newer truck? A fiberglass hard cover painted to match your truck might be the way to go. They all look cool with the right application,” according to Buy Auto Truck Accessories. Cost: The biggest con of pickup truck tonneau covers is the price tag. Although prices vary greatly depending on the brand and type of cover you opt for, they typically run between $200- $1,000+. Some truck owners prefer soft covers which cost less than hardcovers on average, although hard covers offer a greater level of protection for items in the truck bed. It’s important to do your research on things like hard vs. soft, brand and installation requirements when opting for a tonneau cover. Difficulty to use with other truck accessories: Sometimes tonneau covers prevent access to other truck accessories, such as a tool box or bed rails. If you currently have truck bed accessories installed on your truck, be sure the tonneau cover you’re looking at is compatible with those items. A simple call to the tonneau cover manufacturer should inform you of this. Installation issues: Like any truck accessory, it’s important to install your tonneau cover correctly or you risk it not working properly. If you’re unsure of how to install the cover, leave it to a professional. “… you may find that some covers require you to drill holes in order to attach them to the bed. Some people don’t want to have to drill holes in their bed as it may lower the value of the truck. If this bothers you then simply buy a cover that uses clamps instead of screws,” according to Bed of a Truck. Before purchasing a tonneau cover for your truck, research the pros and cons thoroughly. There are many benefits to a tonneau cover, including protection from weather elements and theft and an enhanced look for your truck. Some of the cons of tonneau covers include the price, not being compatible with other truck accessories and installation issues. ← 2017 Gas vs. Diesel Truck Comparison: Which is Better?